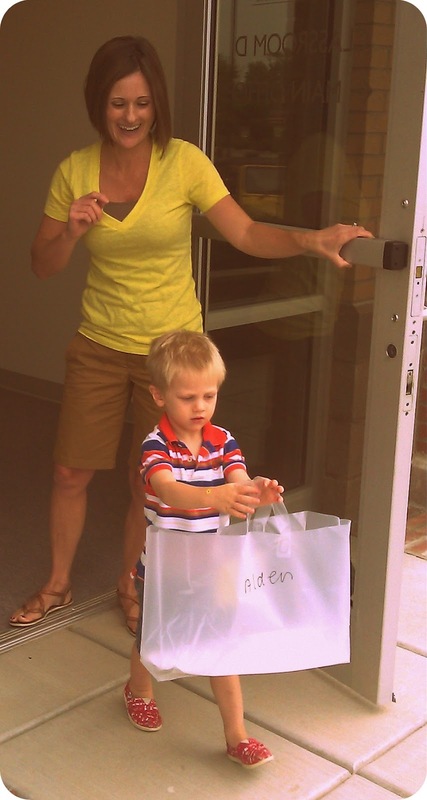 Alden started preschool on Tuesday. I am happy about that because that means that I will get some more 1:1 time with Mom. Tuesday started out great, but Alden got a bit teary eyed turning into the preschool parking lot. 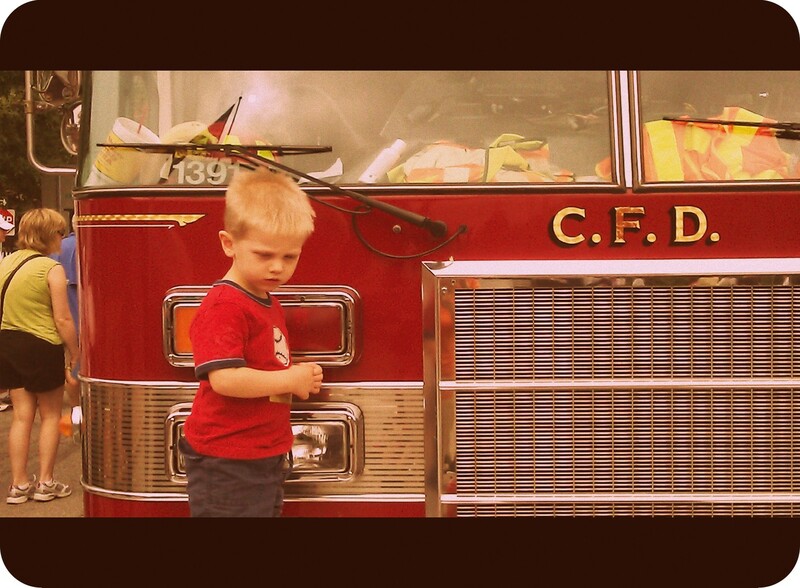 When it was time for Mom and I to leave Alden started to cry. Mom told me it made her heart hurt to see the assistant teacher hugging him as we got in the car. When we went to pick him up the teacher said Alden did great. He also did great on Thursday (no tears). Tonight Alden told us at bedtime that he knew he was going to be dropped off for "just a little bit" and that he isn't going to cry tomorrow. Alden asked to have "Maisy Goes to Preschool" read to us tonight. We got a new used car. Mom and Dad are sad about it. It is a mini van, but Mom is calling it the "party van." It is for hauling us kids and the dogs around. Alden LOVES playing with the doors and how he can walk through the middle of it. 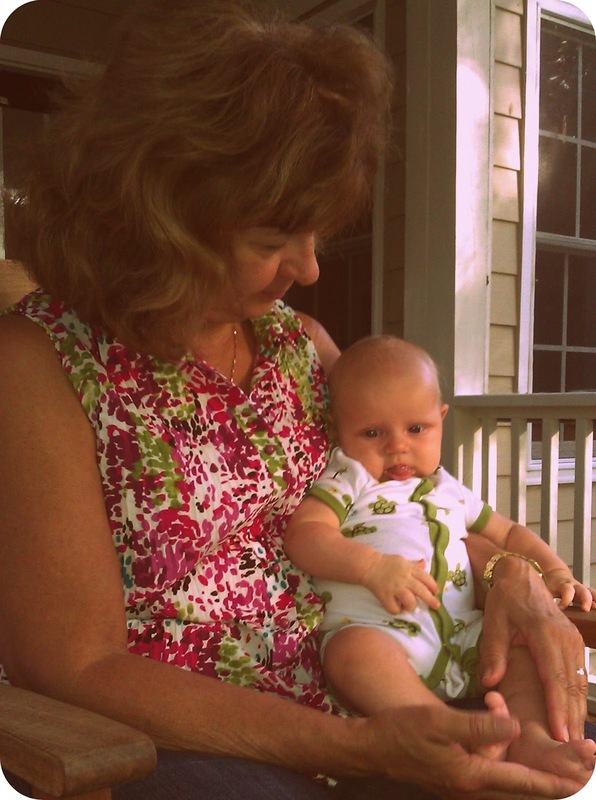 Grandma J came to stay with us for the weekend. Mom needed the help because Dad was on an airplane. I got to use her as a human bassinet. Lots of cuddles for me! I also took the opportunity to demonstrate to Grandma what I mean by "blow out." We went to an art show in downtown Cary on Saturday. I am not interested in art so I used the time to snooze. 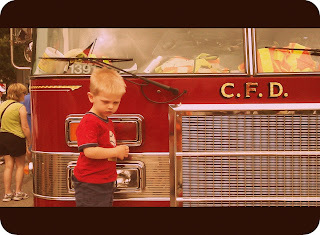 There was a fire engine at the show and one of the fire fighters showed Alden all over the truck. Alden keep asking "what's in there?" and so the fire fighter kept opening more and more compartments. I am having fun playing with spit bubbles in my mouth. Hobbies are good! Alden exiting day 1 of school. At the end of an awesome tour! 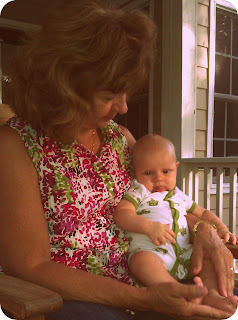 Trent and Grandma enjoyed rocking outside.